When the surgeon that performed my cancer surgery told me in November, that my duodenal cancer has a history of returning it reminded me of my immortality. It may have been negative news, but it also reminded me of many events of my 68 years of living, that were either positive and negative. 1944 – Was born on October 14, just four months after the D-Day landing and World War II would be over in Europe, about six and-a-half months later in April of 1945. 1950 – My first memory is of walking to school with my brother on the first day of school to Pineville Elementary. I remember Mrs. Price was my first grade teacher. School lunches were only 10 cents at the time. 1951 – This is the year I rode my last school bus in the second grade, when I accidentally got off the bus in Libuse, instead of five blocks from Louisiana College, so walked home that day from Libuse to Pineville. I never rode another school bus after that day. 1952 – We moved from Holloway Drive to Burns Street in February of 1952, moving from a small house to a very large house. The house payment was $55 a month, which was a bargain at the time. 1954- Think this is the year when my dad purchased our first television, when I was nine years old. He didn’t buy it for entertainment reasons, but because my sister had a lazy eye and a special screen was placed over the TV screen, that made her use her lazy eye. We bought it at L.B. Henry’s store on Main Street, when they were selling televisions. Our first TV was an Admiral. This is also the year I really became interested in baseball and remember listening to the 1954 World Series between the New York Giants and the Cleveland Indians. Willie Mays made his famous catch in one of those games on a ball hit by Vic Wertz of the Indians. 1955 – Ray Kroc opened his first McDonalds fast food restaurant (the McDonald brothers opened the first eight, before selling out to Kroc.) Once after he bought the San Diego Padres they were playing so badly, that Kroc said over the public address system that his short order cooks at McDonalds could play better the Padres. This was the first year I played Little League baseball. I went to a local hardware store to buy a baseball glove and wanted to buy a $6.50 glove. Only problem was that I only had $6, but the owner Mr. Brister let me have it for $6. It was a Nokona brand glove. 1956- My main memory of 1956 was when Don Larsen pitched the only perfect game in a World Series. He recently sold his uniform from that game for $756,000 and is using part of the money to pay college education expenses for his grandchildren. 1957 – Elvis Presley buys Graceland for $100,000, since their last Memphis home had attracted too many fans, with no way of keeping them off the grounds. This was the year my baby sister was born on March 23. Three months later the worst hurricane to hit Alexandria-Pineville area in my memory hit the area, with full force when Hurricane Audrey hit. Audrey had earlier killed 500 people in Cameron, Louisiana. I remember Jim Gaines of KALB Radio telling, about the progress of the hurricane and the damage being done. We had a very tall pine tree fall in our yard, but was not close to the house. August of 1957 would bring many memories when my dad, older brother and me took a road trip in our 1949 Packard, from Louisiana to Maine. We made the usual tourist stops like Rock City, Lookout Mountain, Mount Vernon and other tourist attractions. We visited the most tourist attractions in Washington, D.C. We visited the National Archives Building, Capitol building, White House (just saw it from the fence), Lincoln Memorial, Washington Monument, Smithsonian Institution, Bureau of Mint and Engraving and watched the workers print sheets of currency. We visited the Franklin Institute in Philadelphia and saw a show at the planetarium, plus visited the site of the Liberty Bell. However, the main thing I remember from the Philadelphia visit was seeing my first major league game. The hometown Phillies were playing the visiting Pittsburgh Pirates in Connie Mack Stadium. I remember fans bringing paper bags with bottles in them to the game. I can only imagine what was in those bottles. I also remember the Phillies fans booing their own players. The highlight of the game was when Bill Mazeroski hit a home run that hit the tin roof over our heads, in the left field bleachers. Three years later Mazeroski would hit a walkoff homer that defeated the New York Yankees in the 1960 World Series Game 7. Saw my grandpa for the only time in my life in the hospital. Not sure where the hospital was located. It was either New Jersey or Pennsylvania. My dad’s folks were living in Millville, New Jersey. Will never forget my dad driving through the Bowery district in New York City and seeing men laying on the sidewalk. That would be the only time for me to visit New York. Then we went on to Beverly, Massachusetts and ate at a Howard Johnson’s restaurant, with the classic orange roof. My dad was in town for an American Chemical Society convention, then after the convention ended we went to Maine, to see my uncle and aunt and their family. It was the only time I saw my cousin alive, since he was piloting a helicopter in Vietnam, when he was shot down and killed. Then we raced back to Louisiana, stopping only one night at Warsaw, Kentucky, then my dad drove almost non-stop since school started the next day at Pineville Elementary. The next month the Milwaukee Braves would win the 1957 World Series. 1958 – Played Pony League baseball in 1958, which would be my fourth and last year of playing baseball. One night when we were playing a game, someone hollered “That plane is going to crash” and we saw a plane plummeting to the ground, about two miles from the park. It crashed about a block or two off of Main Street near a National Cemetery, but not positive about the exact crash site. This was also the year I entered Pineville High School. It is difficult to believe that this was 55 years ago. Finding classes was not easy that first day, since I wasn’t used to attending such a big school. The Milwaukee Braves took a three games to one lead in the 1958 World Series, but would let the Yankee,s that they had defeated in 1957 come back to win the World Series. 1959 – I remember this being the year my older brother graduated from high school. February of 1959 would see Buddy Holly, Ritchie Valens and the Big Bopper go down in an airplane crash in Iowa. The Big Bopper had appeared in Alexandria, Louisiana about 1958, at a KALB Radio record hop. 1959 was also the year the White Sox won the AL pennant but lost to the Los Angeles Dodgers in the World Series. The highlight of 1959 was our trip in a Volkwagen Micro-bus, which took us to Missouri, Canada and back to Louisiana. My dad was taking classes at the University of Wisconsin in Madison, so we stayed mostly in Missouri at the 80 acre farm of my grandpa and grandma. They had only recently installed indoor plumbing in their home. I will never forget the huge console radio on the living room floor. The sound was great and I could hear the Kansas City Athletics baseball games on the radio. Saw Leave it to Beaver for the first time on their television. Don’t think it was on KALB TV in Alexandria, La., since it was on another network. We spent part of the summer at the Chateau Cottages near Devils Lake in Wisconsin. We were on a tourist boat, when the captain asked me to pilot the ship. He sold souvenirs, while piloted the boat up the Wisconsin River. It was a relief when he took over the helm, since there were a lot of duckboats on the water. Then after my dad finished the summer classes we drove to Chicago. It was amazing to look up at the tall buildings on the Loop and we went to a church in Berwyn, Illinois. Then we drove to Detroit and visited the Ford headquarters and also toured Post Cereals factory and can’t remember if we also toured the Kelloggs plant. We crossed into Canada at Windsor and journeyed to Brantford, Ontario where my mom had relatives. We then went to Niagara Falls and crossed back into the United States. My dad was stopped by the Canadian Mounties, because our Volkswagen micro-bus resembled a vehicle they were looking for. At one point during our trip while driving in the United States a driver hollered “Governor Long” at us, when he saw the Louisiana license plate. This was the same year he managed to escape from a mental health institution, so Louisiana was in the news a lot that summer. 1960 – Nothing stands out about this year for me, except for the Pittsburgh Pirates defeating the New York Yankees in Game 7 of the 1960 World Series. Bill Mazeroski, who I had seen hit the home run, in Philadelphia three years earlier hit a walkoff home run over the left field wall, that made Pirates the world champions of baseball. 1959 was not a good year for Governor Earl K. Long, the Democratic governor of Louisiana. Governor Long wanted to retain his position as governor, but was prevented from running again, since he was not allowed to succeed himself. So that problem, along with the return of his heavy drinking and taking up smoking again, combined to place him in a bad mental state. In addition he was taking pills to make him sleep, in combination with uppers and downers. The situation was exacerbated when he was in a rage as he ranted during a legislative session. He later meant to apologize for his behavior, but instead flew into another rage instead. Jesse Bankston, the Louisiana Director of Hospitals, thought that Long needed immediate treatment, so had him restrained for two days, while mulling over what to do next about the governor. It was determined that it would be better to transport Governor Long to an out-of-state hospital, so that he could not use his power of governor, so he was sent to a Galveston, Texas hospital. He was strapped into a gurney and flown from Baton Rouge to Galveston and taken to John Sealy Hospital. Dr. Titus Harris had been informed that Governor Louisiana was there on his own volition, but found out that was not the case. Governor Long filed papers to be released from the hospital, after threatening his wife Blanche with federal kidnapping charges, for having him transported across state line to Texas. He then made a deal with Blanche and Russell Long, that he would consent to be sent to Oschner Foundation Hospital in New Orleans. However after one day there, he told Blanche wanted to Winnfield to rest. Blanche told him that he had promised to stay at Oschner, but Earl said that he didn’t say how long he would stay. Blanche Long worried about what the governor might do next, had Chester Williams the coroner of Baton Rouge prepare the papers, to have Governor Long committed to a state mental institution. Meanwhile Long who had left Oschner Foundation Hospital in New Orleans, was intercepted by six sheriff’s deputies and taken to Baton Rouge. The deputies dragged the governor of Louisiana, kicking and screaming, out of the car. They punched him, knocked him to the ground, and put him in their car. He was examined by the coroner, who was not a psychiatrist, and by a psychiatrist who had never met him. The psychiatrist rendered a diagnosis of paranoid schizophrenia, which was quite commonly used at that time to commit anyone for any reason. He was taken to Southeast Louisiana Hospital in Mandeville, where he was admitted under the commitment order. While he was treated there, the acting director of the hospital, Dr. Charles Belcher, later indicated that they had not made any final diagnosis of his true condition. Governor Long contacted Joe Sims to represent him in a habeas corpus hearing in Covington, Louisiana. The governor had a trick up his sleeve though. He called a meeting of the state hospitals board to meet before the hearing. The governor had Jesse Bankston removed from office at the meeting, then appointed a friend of his as the new director. The new director then proceeded to fire Dr. Charles Belcher the superintendent of Southeast Louisiana Hospital. The new superintendent, then stated that there was no reason for Governor Long, to remain in the hospital and authorized his release. Governor Long was taken to the Green Springs Motel in Covington to eat breakfast, but refused to eat food off his plate, fearing it might be poisoned, so helped himself to the food on the plates of the others eating there. He would spend the next few days at the Pine Manor Motel in Covington and while he was there Blaze Starr a stripper, from Bourbon Street in New Orleans paid him a visit on July 2, 1959. His romance with Starr seemed to be more of a revenge thing, after Blanche had him committed. Governor Long was in the national news that summer and we happened to be on vacation from Louisiana to Canada. One vehicle we encountered on the trip had someone holler “Hey Governor Long” at us. They probably couldn’t help themselves, when they saw the Louisiana license plates on our vehicle. 53 years have passed since our governor went off the deep end and while researching today, have learned more about those days in one day, than what I have learned in the previous 53 years. Governor Long was intent on becoming governor, but when he saw it wasn’t going to be allowed, he ran on the Noe-Long ticket with former governor of Monroe. The ticket came in a disappointing fourth place polling only 97,654 votes. They finished behind deLesseps Morrison with 278,956 votes, former governor Jimmie Davis with 213,551 votes and Senator Willie Rainach, who Long had ranted against in his legislature outburst received 143.095. The three candidates garnered 635,602 votes compared to the 97,654 votes for the Noe-Long ticket. It looked like the political career of Governor Earl K. Long was dead in the water. But this is Earl K. Long we are talking about and he entered the race for the 8th Congressional District against incumbent Rep. Harold B. McSween. Surprisingly he won the election but died on September 5, 1960 at the age of 65, before he could take office. The years 1959 and 1960 were turbulent years for Governor Long. It all started with his rant in the Louisiana legislature, then progressed to him being committed in two mental institutions, firing the administrators to be released. Then came his affair with the Bourbon Street stripper Blaze Starr, his loss as a lieutenant governor candidate in 1959, then he arose from the ashes to win the 8th Congressional representative seat, shortly before dying. I only saw Governor Long once. He was at the Continental Trailways bus station making a speech on the stump, while handing out chickens to those, he hoped would vote for him. Louisiana politicians were and are still known for taking their politics seriously and nobody took politics more seriously than Earl K. Long. This video starts with some politicking by Huey P. Long who served as governor of Louisiana and United States Senator for only a total of seven years. His short speech is followed by female bandleader Ina Ray Hutton singing Every Man a King accompanied by her band the Melodears. 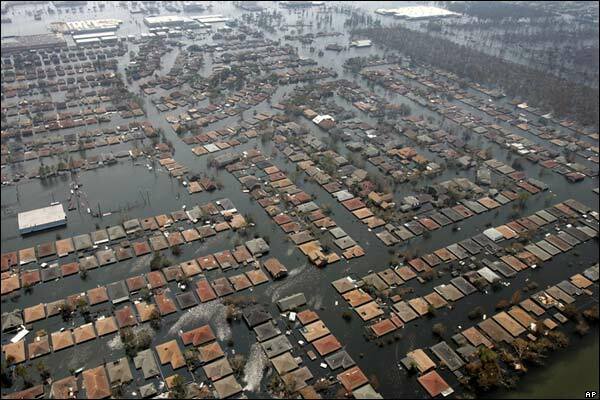 August 29 will mark the fifth anniversary of Hurricane Katrina which cost 1,836 lives due to the hurricane and floods which caused property damage of $81 billion and left thousands homeless. 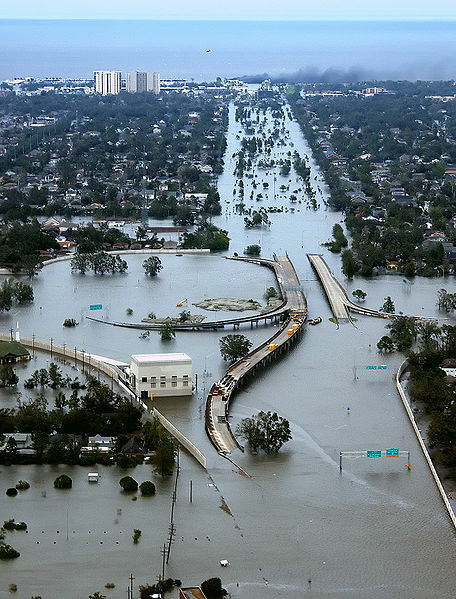 It doesn’t seem like it has been five years since Hurricane Katrina hit the United States on August 29, 2005. The aftermath of Hurricane Katrina left thousands of refugees without homes. The refugees first went to the Superdome for safety but when the levees broke many of them had no homes to return to after the levees broke and water as high as 15 feet flooded the city in some places. The hurricane did massive damage to the city but the flooding turned a bad situation into an even worse situation as stranded flood victims begged for someone to rescue them from the roofs of their houses. While this was going on there were thousands at the Superdome and Civic Center who had no food or water for several days as the government was extremely slow in responding to the calls for food and water by the refugees. I don’t know the timeline in Haiti as to how fast food and water arrived after the earthquake there but I have a feeling they may have been given food and water faster than those refugees in New Orleans who begged food and water for days before finally getting help. President Bush told the television networks that Michael Brown was doing a great job as FEMA director while there were thousands of people begging for food and water to stay alive. While nobody was responding to the calls for help people were dying from the lack of food and water to sustain them. How could government officials see the pain the people were in and not respond sooner is beyond me. I know it takes time to get the food and water to the refugees but there should have been a contingency plan that could have expedited the relief efforts. I realize that it was not easy to get to the refugees because of the flooding but why wasn’t there some airdrops made that could have dropped pallets with food and water for the refugees. The television networks documented the situation showing the need of the refugees yet it seemed like nobody in the government was doing anything to alleviate the situation. People were dying in the city because they were unable to get a bottle of water for each refugee. Not only did the federal government fail the refugees but the state and local government did nothing till after refugees had died from lack of water and food. Hopefully some lessons were learned by the different government entities that failed the refugees that will prevent another situation like was experienced by the refugees in the aftermath of Hurricane Katrina. Thousands of the refugees who had no homes to return to boarded busses to different destinations taking them to an uncertain future in different parts of the United States. Many of them have never returned to New Orleans. My son left New Orleans before the hurricane hit riding his bicycle and made better time than the motorists who were in long lines of cars exiting the city of New Orleans. We were living in Pineville, Louisiana which is 219 miles northwest of New Orleans at the time of the hurricane. The hurricane didn’t affect us much since the hurricane hit the eastern side of the state. However we had an interest in what was happening to New Orleans since we had been there several times over the years. Brian Williams of NBC made an interesting retrospective of what it was like when Hurricane Katrina hit and the aftermath on a recent Dateline NBC program that reminds us again of the suffering endured by the refugees of Hurricane Katrina. This photo shows how the flooding covered part of the I-10 and I-610 interchange in the New Orleans area. I was impressed by the sincerity of Brian Williams in the Dateline NBC program and his ability to tell what it was like to be there in the center of the storm and the aftermath in which our government was unable to respond to calls for food and water until several days after the hurricane had hit. If the government doesn’t have a better contingency plan than we had in 2005 we are doomed to repeat history the next time a major hurricane hits the United States. Governor Jimmie Davis of Louisiana singing You Are My Sunshine at his inaugural ball in 1960. Jimmie Davis didn’t need anyone to tell him what poverty was since he was the son of sharecroppers Samuel Jones Davis and Sarah Elizabeth Works and slept on the floor until he was nine years old. He went to college at Louisiana College in Pineville, Louisiana where he received his bachelor’s degree and would earn his master’s degree at Louisiana State University. His biggest hit You Are My Sunshine was an international hit covered by hundreds of singers. There is some controversy about who the originally wrote the song. Some online reports credit Governor Davis with writing the song but there are articles saying that he bought the song from Paul Rice of the Rice Brothers. Regardless of who actually wrote the song he has the copyright for the song and should have received royalty payments till his death. It is known that he purchased the song It Makes No Difference Now (my personal favorite after You Are My Sunshine which has been the Louisiana state song since 1977) from songwriter Floyd Tillman. Governor Davis was elected governor for the first time in 1944 and recorded There’s A New Moon Over My Shoulder in 1945. He would also leave Louisiana to make movies in Hollywood during his first term. He would be elected again to the governor’s post in 1959 defeating Mayor deLasepps Morrison of New Orleans in a runoff to be the Democratic candidate for governor and then defeating Republican Frances Grevemberg in the general election. When Governor George Wallace made his bid for the presidency of the United States in 1968 he said if General Curtis LeMay had turned down his offer to run as vice president he would have chosen Governor Davis as his running mate. His first wife Alverna Adams died in 1967. He would later marry Anna Carter Gordon of the Chuck Wagon Gang. Most of his descendants lived in Louisiana, Arkansas, Alabama, Georgia and North Carolina according to the chart. Governor Davis was singing southern gospel music in his later years and one of his best known sacred songs was Suppertime. He did an outstanding job on songs with recitations. He co-wrote the southern gospel standard Sheltered In The Arms of God with Dottie Rambo. Governor Davis and Dottie Rambo singing Nobody’s Darlin’ But Mine and what Dottie calls the biggie You Are My Sunshine. Governor Davis singing It Makes No Difference Now in the movie Louisiana. Governor Davis singing There’s A New Moon Over My Shoulder in the movie Louisiana. This is Jimmie Davis singing in 1991 at apparently the Grand Old Gospel Reunion. Jimmie Davis grew up dirt poor but he still made something of himself by getting an education and becoming the governor of Louisiana. He not only was a great governor and my favorite governor during my lifetime but was an excellent singer. He wrote what may be the best known song in the world You Are My Sunshine and could sing a southern gospel song with more emotion than most because he knew what God had done in his own life. He is one of the few people that lived in three different centuries being born in the 18th century and dying in the 20th century. Governor Davis may not be with us now but we will always remember his days as governor and we can still listen to the musical legacy he has left for us to enjoy.